4000 miles and we begin to get acquainted with our steeds. For Liz, this has meant long climbs and sore knees. Strengthening exercises a morning routine. The pain remains. Something just isn’t right. In Santa Fe, we finally have the opportunity we are waiting for. Good bike shops and lots of time to make something happen. 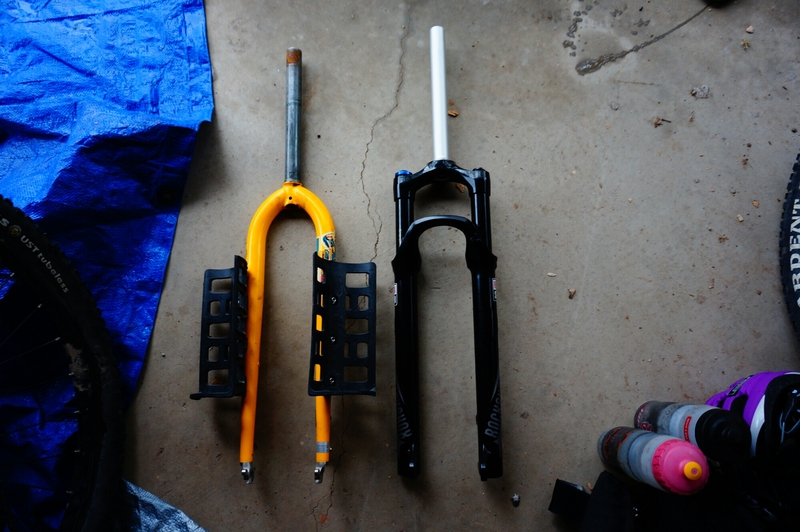 Mellow Velo helps us source new cranks. Lower gears. We pass the time waiting for the cranks to arrive researching gear inches and frame geometries. Liz reads a post by Off Route and sees a familiar theme. She sends it my way. Liz may need a new frame as well as lower gearing. 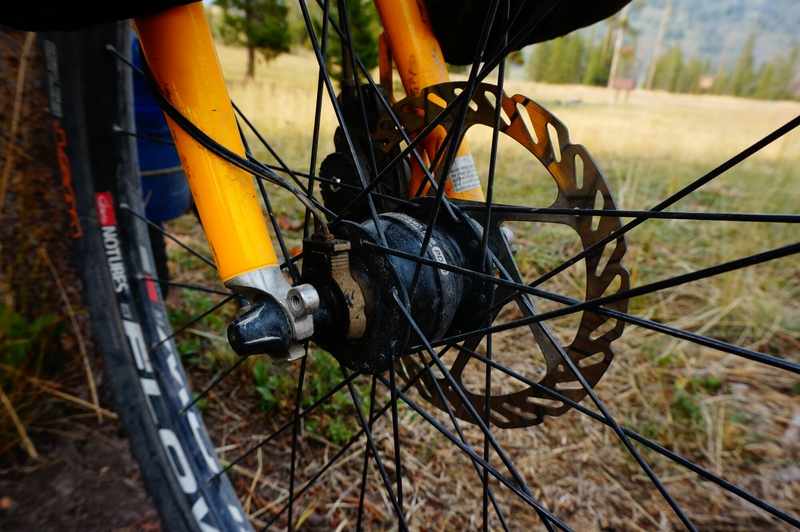 Moving from 29″ wheels to 27.5″ wheels is another way to reduce the amount of force required to climb. 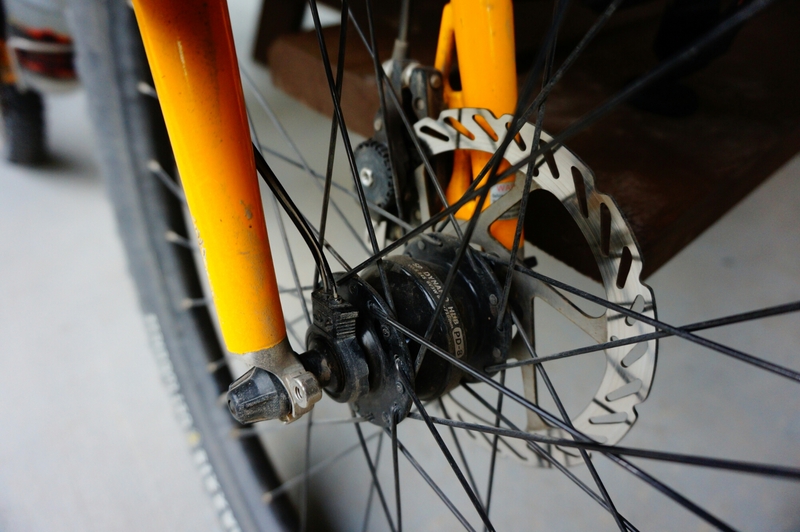 At 5’3″, the smaller wheel set will allow for a better fit and a lighter set up. We consult the owner of Mellow Velo the following day regarding fit. Luck would have it, that at that exact moment, a customer brings a Soma B-side into the shop. It’s the exact size we are looking for. We ask the customer if Liz can try it out. She rides around the parking lot. Much more room between handle bar and knees. We decide to go for it and ask the shop owner to order a frame but everyone is out of stock in the size we need. 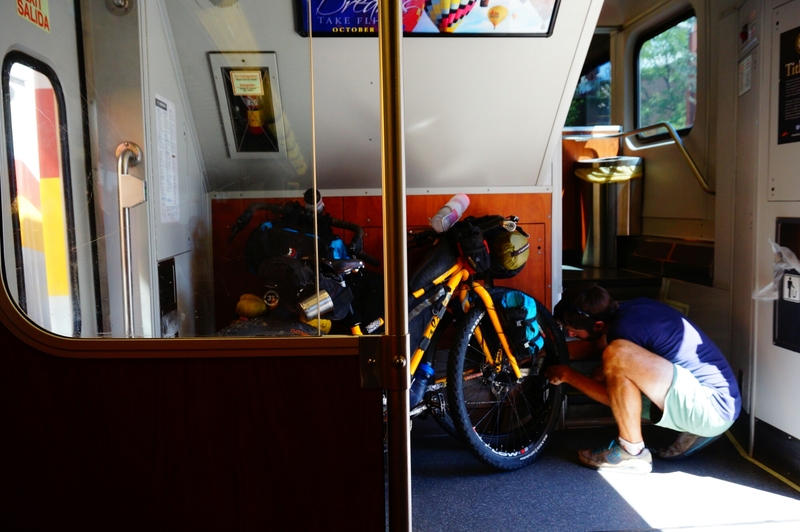 Unable to wait longer, we get the cranks and move on to Albuquerque loaded with ideas. In Albuquerque, we find out that the frame could be a month out. Maybe more. We work with another bike shop to try and improve the fit instead of swapping frames. A new seat post and stem move Liz forward on the bike and create more room between hands and knees. 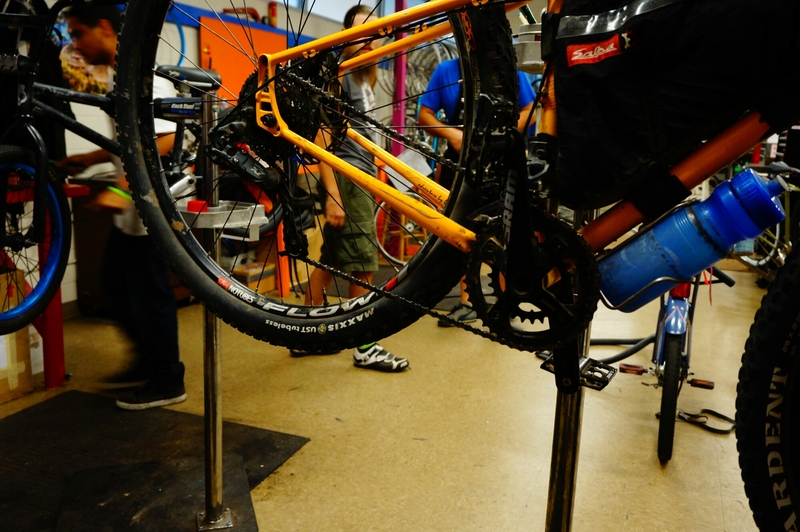 New cranks are installed at Esperanza Community Bike Shop. It’s a quick solution that will be tested in the coming weeks. My bike sees upgrades as well. A new RockShox Reba RL shock for the front and a modified Salsa Anything Cage HD for the down tube. A sawzall makes for quick work removing part of the cage that interferes with the front chain rings. 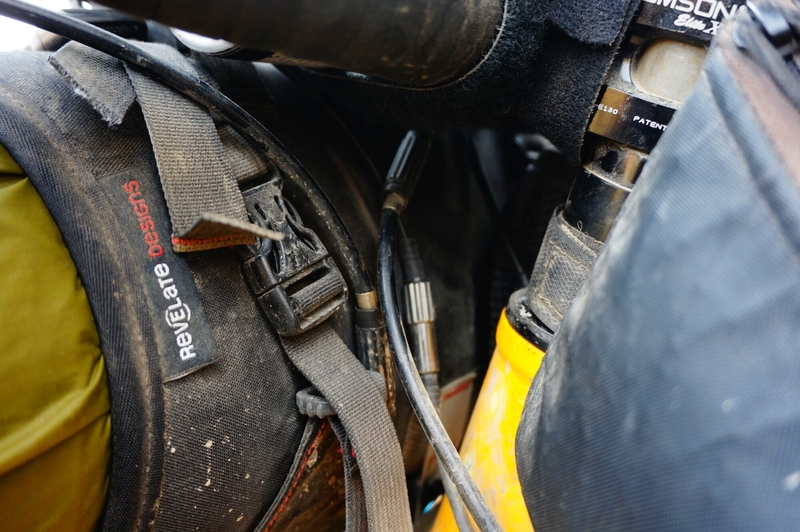 Clearance with the front shock is tested by draining it of all air pressure and bottoming out the suspension. A few well placed dents are made in a 64 oz Gatorade bottle. Everything fits. I can carry 2 liters in the new cage where I previously had 0.7 liters. Liz’s bike gets the same mod for water. No new shock for her yet. We want to test the new fit. If it works, a new shock is in her future. If not, a new frame. As for the shock pump that one is advised to carry with air suspension… it’s getting tossed. I’ll use the bike pump we already carry if there is ever a need to add air in an emergency. I’m already developing an SOP (standard operating procedure) where I can set the shock pressure accurately without a gauge. Planning long distance rides off the beaten track require some homework. 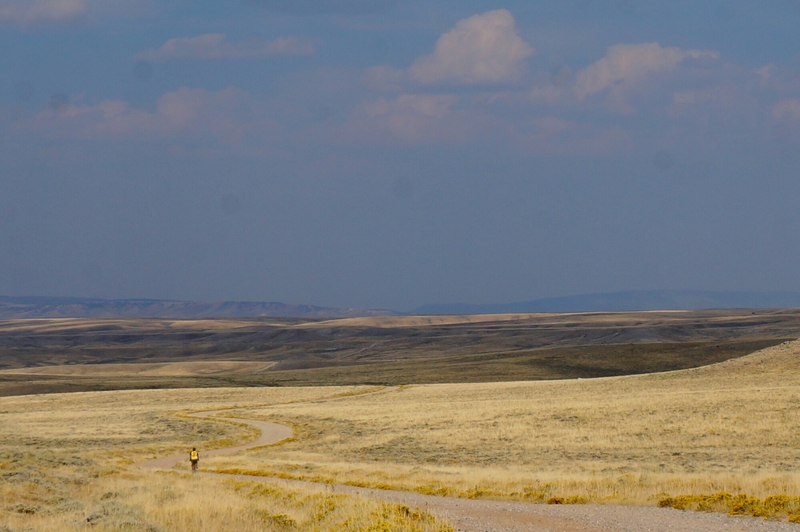 Luckily, most of our riding has been on the Great Divide Mountain Bike Route put together by Adventure Cycling. This has been a wonderful route. The maps provide details on where to find the next grocery store and water source as well as some brief history about each area. 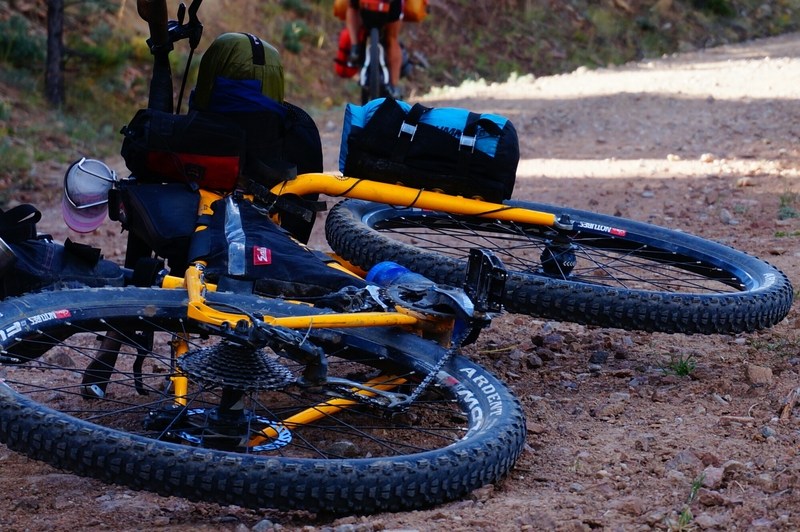 It’s the perfect bike packing starter to test your ride and yourself before leaving the country on grander exploits. Of course, it would be easy if we could just follow the route. But we can’t. Distracted by friends, family, the glamor of big city lights, we keep making detours. This can get tricky. Hairy vehicle packed highways. No shoulders. Fast speed limits set us on edge. As a result we try to connect dirt roads as often as possible. 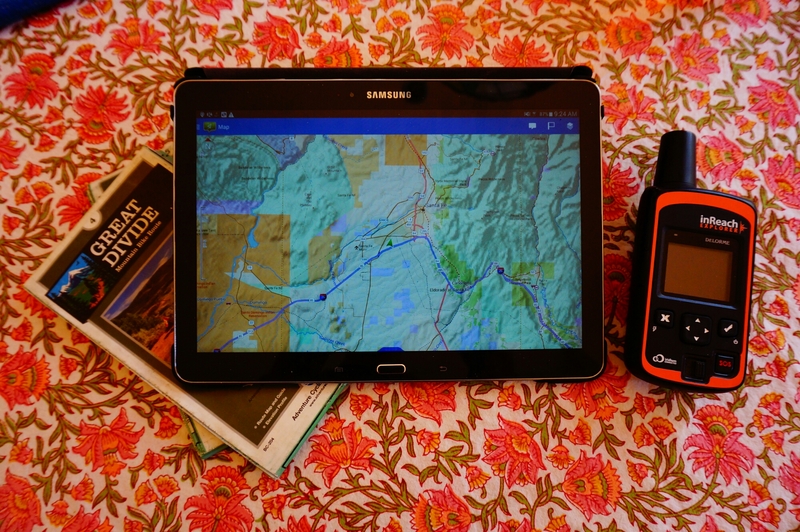 This is where Google Maps and Delorme’s Earthmate App come to the rescue. Another helpful resource is the National Forest Locator Map. 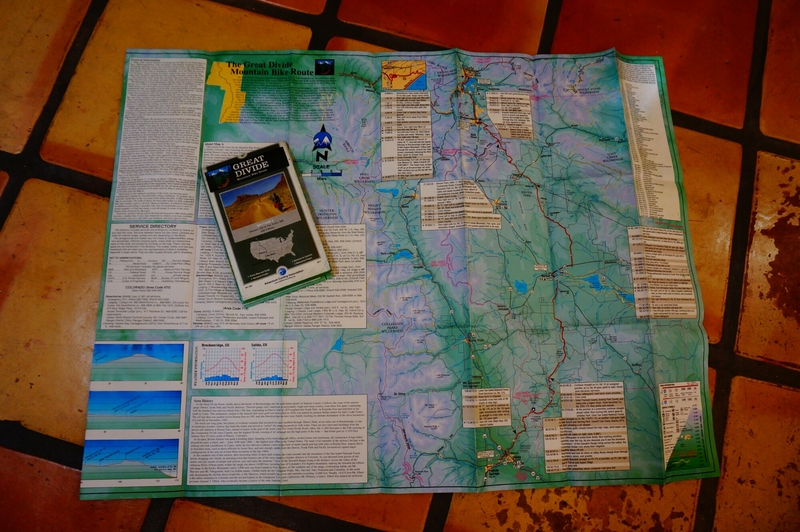 Each national forest has a link for bicycle trails but I’ve found the motorized use maps to be the most helpful. These cover all the dirt roads through the area and what vehicle type is allowed. Lastly, the Department of Transportation in each state has put together a bike map that provides shoulder widths and traffic volume for the main thoroughfares. This is for use when all else fails and we have to ride the road. The maps themselves can be a bit difficult to find. I’ve had my best luck searching “(state name) Department of Transportation Bicycle Map” and Google usually finds what I want. 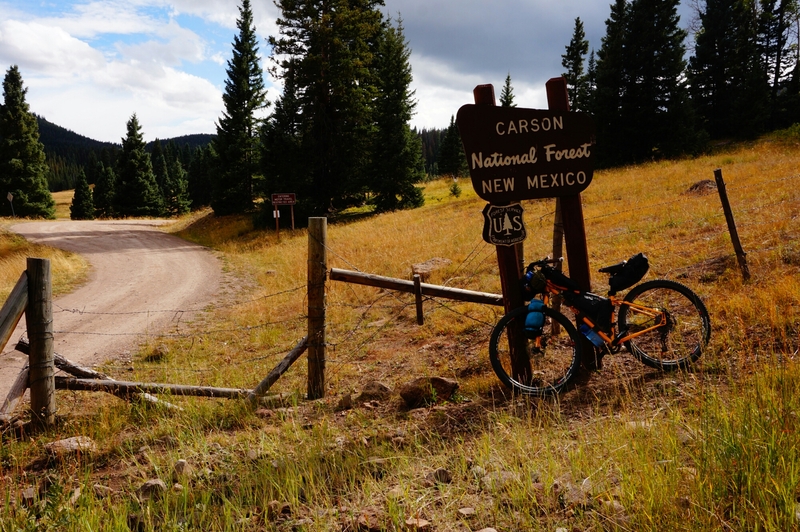 Most states have been spot on with their descriptions of the road ways. New Mexico has not. Find local knowledge or consult the police for good road riding. Have you had any issues? How are the bikes? We hear this a lot on the road. Below are a few items we have dealt with since leaving Alaska. Front Hub – 500 miles into the trip my front hub started to make noise. Another 100 miles later it began to wobble. We were in northern Alaska (Chicken) with no bike shops nearby so we orchestrated the delivery of a new hub (under warranty) to a bike shop in Whitehorse. This meant riding another 500 miles on the bad hub, wobble and all. Since then, I’ve put 3000 miles on the new hub without any issues. Heat – Has been unbearable at times. Only solution is to find shade and a cold drink. 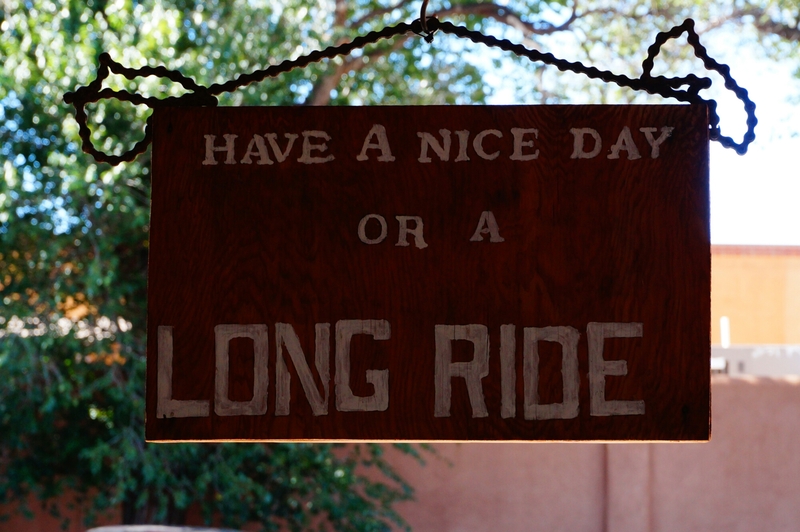 Ride early. Barrel Adjuster – These are used to adjust derailer tension. They can also be frustrating when a load is strapped to the handle bars causing the barrel adjusters to rub against each other. I’ve had one fully tension itself and strip its threads from moving the handle bars while riding. The immediate solution is to wrap them in electrical tape so they can’t move anymore. Long term, I’ll probably get rid of them and find other ways to adjust the derailer. 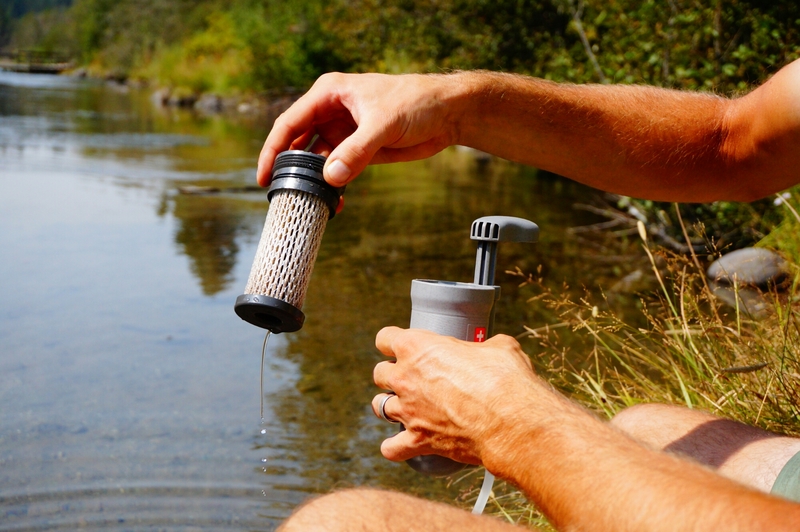 Water Filter – We ended up tossing a MSR filter I’ve had for years. I put a new cartridge in it when we left Anchorage and it had performed well. Unfortunately, we couldn’t find another replacement cartridge on the road so it got tossed for the Katadyn Hiker. Water Filter Part Two – The Katadyn filter clogged after 7 days of use and the check valve on the filter body broke. Katadyn sent a new body for us to pick up in Rawlins, WY but I would have preferred getting my money back. We are now using a Steripen Ultra. The Steripen uses ultraviolet light to sterilize water for drinking. It’s also rechargeable and micro USB. This means we can charge it while riding. So far so good. 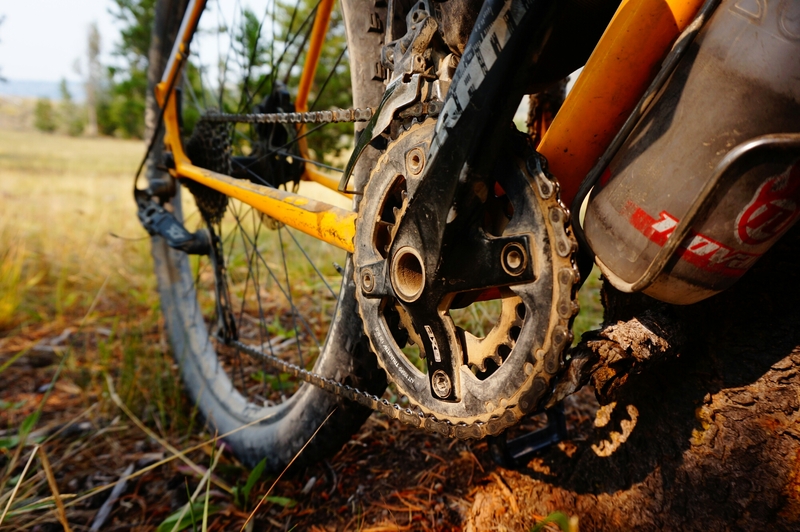 Chain Rings – The chain rings on the Fargo are to large for the riding we are doing forcing us to mash the pedals and often walk up steep sections. We swapped out the 28 tooth chain ring for a 26 tooth in Pinedale. We may go even smaller in the future. Tires – We haven’t had any issues with our tires. I hope I don’t jinx any future riding but I’m a true believer in riding tubeless. 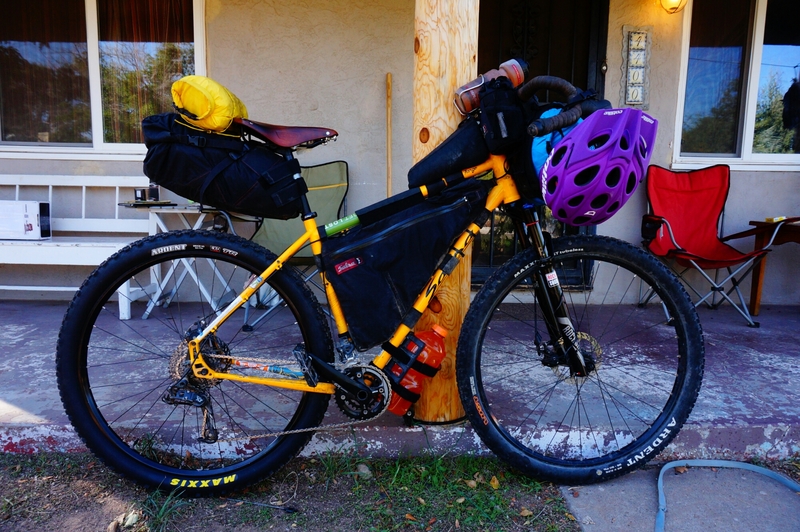 Each bike has nearly 4000 miles with no flats. We ride on. I want to take a step back and talk about the charging system we are using in a little more detail. We got the initial idea to use a hub dynamo from Gypsy by Trade. As I ride down the road a set of magnets rotates around a coil in the front hub. As this happens, an alternating current is created with varying voltage depending on how fast I’m riding. There is just one problem. All of our electronics require direct current at a steady 5 volts. This is where the Sinewave Revolution comes in. The dynamo is wired to the Revolution which converts the Alternating Current to Direct Current using solid state electronics. I’ve used velcro to secure the Revolution to the top of my frame bag to keep it dry and out of the way. I’ve also added a grommet to the front of the frame bag and run my wiring through it for a cleaner look. Use a USB cord to connect any gadget that needs to be charged and start pedaling. Just remember to keep your speed up. Below a certain threshold the system doesn’t generate enough electricity for charging. This typically happens for one of two reasons. Yours truly has decided to tackle a vertical wall or a fierce head wind is beating me into submission. Otherwise I think the system works quite well delivering up to 1 Amp at 5 Volts. I’m currently on my second dynamo as the bearings on the first one failed prematurely. The manufacturer quickly sent a replacement under warranty. We worked it out so that the hub was sent to a bike shop ahead of us on our travels. Since then I’ve added a second dynamo to Liz’ bike and both have run for over 1000 miles now without any issues. Our new dynamo hubs are the PD-8 version. These are a little lighter than the PD-8X and recommended by the manufacturer if your bike doesn’t have a thru-axle. Also, I don’t understand why the device is called a dynamo when it is really a magneto, but that’s just my problem. We are carrying a lot of gadgets on this trip. Every one of which is powered by its own battery pack. It’s a lot to keep track of and to keep charged. 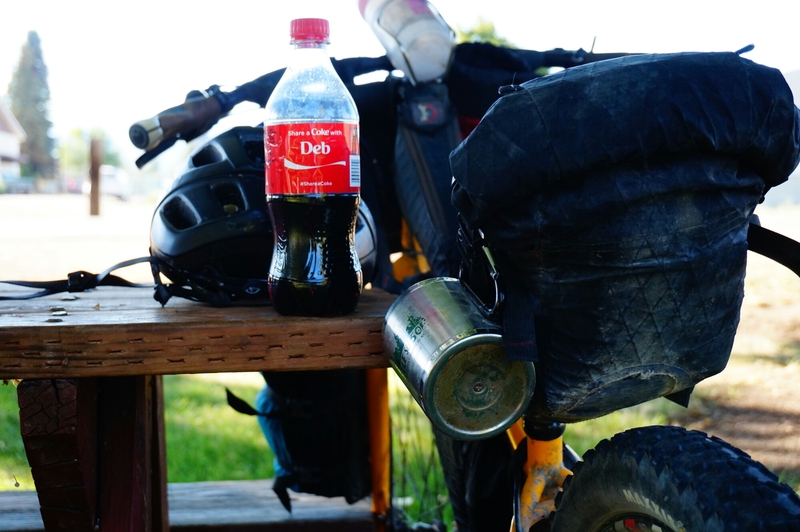 We initially had one dynamo on my bike but have since added a second to Liz’s bike. So far it was a good move. The one dynamo wasn’t enough to charge all of our gadgets meaning we have spent a good deal of time sitting in libraries charging items. Particularly my tablet which is a serious energy hog. Speaking of tablets. Somewhere in my late 20s technology began to leave me behind. It’s crazy to think about. I’ve been using computers as long as I can remember. Some of my first memories are sitting at my grandfather’s World War II era oak desk. A big heavy beautiful thing with an Apple IIe planted firmly in the middle. I spent countless hours at that desk playing Oregon Trail watching green dashes and dots move across the screen. I shot wild game, forded rivers in a covered wagon, and died of cholera. Personal computer after personal computer seceded this one as they became more powerful. Each with more ram and a newer faster processor. I took typing classes in middle school and soon forgot how to write in cursive as I had been taught in elementary school. Eventually in college I had my own laptop and the desktop was an oddity. This knowledge lended well to the work place and made for an easy transition. I can left click, scroll, and type a mile a minute. But wait, what’s an app? I’m 30 now. Technology has made a new leap forward. While traveling, I have seen children occupied with smart phones and tablets using these devices in ways that I’m unable to fathom. I have realized that they will never learn typing or the art of the left click. Maybe they will, but I doubt it. I’m 30 and all the interfaces I learned as a kid are becoming dated. How can I already be so dated? It’s for this reason that Liz and I chose a smart phone and tablet for this trip, leaving the laptop behind. Everything can be done on a touch screen. I’m writing this on a touch screen. I run my finger from one letter to the next, never lifting it from the screen. The tablet builds words and then sentences. With practice I may become faster than I was with a keyboard. I’m learning a new skill set. The muscle memory in my hands is changing. There are frustrations. There are times when something gets deleted or an app doesn’t do what I want. They are of course just apps. Adapted from larger programs run on laptops they don’t have all the features, yet. Excel is one of those programs that takes some getting used to. It’s different. The shortcuts have changed. Some may not be there. But then again, now all my files are stored online, backed up instantly everytime I get a WiFi signal. I can access them anywhere. I’m never worried about a hard drive crashing or the blue screen of death. I don’t ever want to use a laptop again. When we started the trip we had a couple requirements for our technology. First, everything needed to be rechargeable. We didn’t want to carry any spare batteries. This included our headlamps. Second, everything had to use a micro USB port for charging. Say goodbye to any Apple product with their unique charging system. Using micro USB ports means carrying fewer charging cables as we can use the same one for all devices. Be careful here because you may still need two different power adapters depending on the rating of each device. We carry a 0.5 Amp and a 2.0 Amp power adapter to cover all bases. Third, all devices had to have a microSD or SD card slot. Use a microSD card adapter for devices with an SD card slot. In this way, all our pictures, books, and music are easily transferred between devices and backed up to the cloud as necessary. Just try not to loose any of the small microSD cards. They are powerful but also tiny. Below is a list of the gadgets we currently carry with us. All of which meet the above requirements. So after traveling for two months how is it working out? Amazing. I never knew that I could learn so much so easily. I have a line up of pod casts saved to my device. I can learn about new technologies, economics, foreign policy, Pluto! All while riding my bike. I have audio books on loan from my library in Anchorage. I have mapping tools, email, communication. I’m discovering more everyday. The biggest challenge is keeping everything charged. As I said earlier my tablet is an energy hog. I’m going to get technical here so feel free to move on with your day if you’d like. Otherwise, read on. Below is a comparison of four devices from the Samsung website. We carry the Note 10.1 and Galaxy S4 with us. Liz is able to charge her S4 very quickly using the dynamo we installed on her bike while my tablet lags behind. This is of course due to the battery size. My tablet has a battery that is over 3 times the size of the S4. I decided to look at this closer and found that when the screen is on both the S4 and Note have the same operating time. This means I require much more battery capacity per hour than Liz when I’m journaling or reading. I estimate 822 mAh’s for the Note vs 260 mAh’s for the S4. That’s a big difference. 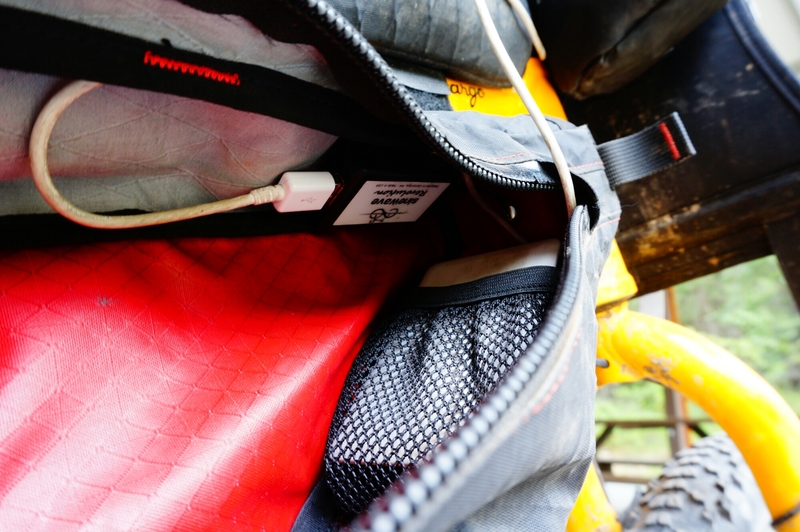 When we pedal, each dynamo delivers a steady 500 mA via the Sinewave. Take the battery capacity and divide by the Sinewave output and in theory Liz can get a full charge on her phone after about 5 hours of riding. It takes me over 16 hours of riding for a full charge and I get the exact same screen time as Liz. This is a problem on the road. It’s one I didn’t think about when choosing a device. I just wanted a big screen that met the three requirements listed earlier. Here is where I would add a fourth requirement. Evaluate the amount of power used per hour of operating time for any tablet or phone. Balance this with your need for screen size. Typically the bigger the screen the more juice it’s going to use. This isn’t a spec listed for you when you buy a device. It’s not a problem for most users as most users always have a place to plug in and aren’t concerned about making their own power while pedaling. That said, I now have a Note 10.1 for sale and will likely replace it with a Tab S 8.4. It uses half the power per hour of screen time when compared to the Note. A smaller tablet means I will likely be able to get rid of the battery brick lightening my load and making more room for food. Time will tell. For all those excel geeks out there, the above chart was made with Google Sheets on my tablet. I still haven’t figured out how to round numbers so you are stuck with all of the digits after the decimal. I apologize. I’ll work on that for next time.